The nitrogen ice glaciers on Pluto appear to carry an intriguing cargo: numerous, isolated hills that may be fragments of water ice from Pluto’s surrounding uplands. These hills individually measure one to several miles or kilometers across, according to images and data from NASA’s New Horizons mission. 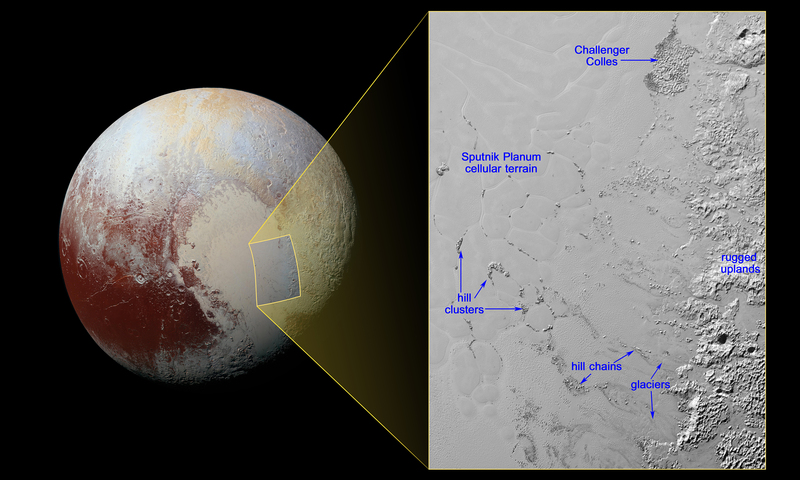 The image shows the inset in context next to a larger view that covers most of Pluto’s encounter hemisphere. The inset was obtained by New Horizons’ Multispectral Visible Imaging Camera (MVIC) instrument. North is up; illumination is from the top-left of the image. The image resolution is about 1050 feet (320 meters) per pixel. The image measures a little over 300 miles (almost 500 kilometers) long and about 210 miles (340 kilometers) wide. It was obtained at a range of approximately 9,950 miles (16,000 kilometers) from Pluto, about 12 minutes before New Horizons’ closest approach to Pluto on July 14, 2015.